Gunslinger Girl is definitely not your happy-go-lucky group of young girls anime. What this anime shows, is a true reality of the lives of these unfortunate girls who encounter problems a typical girl will not. In the heart of Italy, the Social Welfare Agency rescues young girls from hospital beds and gives them a second chance at life using the latest in cybernetic advancements. With their artificially enhanced bodies, the girls are brainwashed and trained as assassins to carry out the dirty work of the Italian Government. Despite all the modifications, they are still just children at heart, struggling for recognition from those they love, even knowing the love they feel is manufactured. This tragic tale unfolds as these girls grapple with their emotions in an agency that treats them as nothing but ruthless killers. If you have watched Strike Witches or Hidan no Aria, you can consider Gunslinger Girl to be similar in some ways, but not in others. True enough that they all have one thing in common: that is, the use of girls with guns. However, what makes this anime so much different that the other two, is that is context is rather gloomy and dull. There is no comedy or any comic relief and you rarely get to see the characters smile. This is a dreaded reality of the story that Gunslinger Girl is trying to invoke. Whether this anime is supposed to question our morality and opinion of the exploitation of these poor girls really depends on how you view the anime. For me, even though the story was quite linear and lack any direction, I felt that there was still some potential for further development in story and characters for the sequel. Mostly though, the episodes consists of either some flashback background story of one of the characters, a assassination of some anti-government rebel or a bunch of guys talking about the morality and values of using such 'cyborgs' in combat. The story lacked some excitement really, but somehow along the way you actually start to care about the poor girls which in turn makes you want to finish the story to see what happens. Art was rather well done and suited the locations shown through the anime quite closely. You can slightly tell the anime is set in some European country by the various settings, people and objects around the place. I must applaud the character design for portraying the characters more European than Japanese. I must accept the lack of facial expressions these girls have since I can understand what happened to them and what they have to go through each day. Sound quality was pretty average. The girl's voice acting was pretty mediocre as well as expected from this anime. Somehow, this anime wants to make the situation as dreary as possible for it to effectively present the story to the audience. In some ways it was effective, in others it was not. Some short sequences lacked any sound at all and I thought my speakers died! Sound effects were rather limited and there was very little background music at all. In a way, this may have impacted viewing experience in a negative sense. The characters were the stronger points this anime had to offer. Of course though, there isn't one single main character in this series, but rather a whole group. As a result, some episodes explained thoroughly the background information about these characters which was informative indeed. I really didn't mind these flashbacks and retellings as they always linked back to the current situation. In the end, the even though the characters did have sufficient background information revealed, I found any lack of appealing quality among them. Perhaps the lack of social interaction and outward display of emotions hindered the enjoyment of watching these characters associate with one another. In the end, Gunslinger Girl did manage to pull through as an interesting anime to watch. The story was pretty mediocre and lack any direction. The art was well done and there was some nice moments here and there. Sound quality was average and the theme songs were pretty bland as well. Somehow you get used to all this gloominess and you push on towards the end. This is one pretty serious anime to watch so don't expect any comedy or comic relief moments. Dull and slightly boring as it may seem. I had plenty of delays whilst watching through this series. Well done and had a unique style to it. Characters looked great and backgrounds were wonderfully illustrated. Voice acting was average and theme songs were rather bland to listen to. Lack of sound in some sequences was disappointing. Plenty of character development that linked in well with the main story. The characters were pretty boring though. Did I enjoy it? Here and there. The action was pretty decent and some story points were well directed. However, I must say that this type of anime is not really my style. 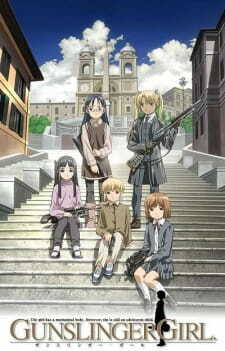 If you are into these type of slice of life anime, then Gunslinger Girl may interest you. This anime is definitely not for everyone to watch for enjoyment. Microsoft has just unveiled a new look and feel to its corporate logo. Following 25 years from its former iteration, this is the first major Microsoft logo change in the company's history. The new logo includes a multicolored symbol that's typically found on the company's Windows products — the first time the wordmark has been accompanied by an image. Microsoft is preparing to launch a range of products this holiday season, including its Windows 8 and Windows Phone 8 operating systems and a new Surface tablet. The software giant's new logo reflects a change in the company's branding that has been triggered by the new look Windows 8 interface and branding. Microsoft's Office team has also adopted a similar interface and style, and Windows Phone 8 completes the trio of products for Microsoft's major rebrand this fall.